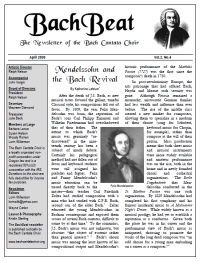 The Bach Cantata Choir publishes the BachBeat newsletter, with background information regarding choir and orchestra members, J.S. Bach and other featured composers, in the weeks before each concert. Click here to be added to the mailing list.